Owning a vintage car is not like owning any average vehicle. Your classic car needs to be handled with great care. In addition to performing routine care with precision and delicacy, classic car owners in Redlands maintain car beauty and function with the help of professionals at times, such as specialized mechanics or detailers. Sometimes, what needs to be considered is the shipping and storage of a vehicle, a detail that is often overlooked as unnecessary. Should the instance arise when your classic car needs to be sent to a new home or show location that is a distance from where you live, arrangements for shipping will need to be made. A vintage car is not shipped like any other car. It is necessary to ensure this valuable asset reaches its destination in pristine condition. To make this happen, you need a shipping company that has the skill and proper equipment. The company should also show you all necessary insurance and licensing to properly ship your vehicle, and provide you with a copy of this paperwork when requested. When viewing insurance information for the shipping company you are considering, be sure to check for any deductible that you might be held responsible for in the event of damage. A pre-trip inspection should be performed, and a report generated for your records. While shipping a vehicle on an open truck saves money, the value of the vehicle is the most important consideration when dealing with a vintage car. In such cases, an enclosed, non-stacking car carrier is more appropriate. This protects your vintage car from the elements, as well as from oil dripping from an elevated level, and thus protects your investment of time and money. For those moving to the Redlands area, car beauty can be maintained when the car is not being used by storing it in our indoor storage facility. Vintage cars can be shipped right to our location, met by our courteous staff and the vehicle owner. When your vintage car reaches its destination, a complete inspection should be done and compared to the original pre-trip inspection report. Should any item on the inspection report differ from the original, the driver should be asked to sign the report so that the company can make amends for any discrepancies. Owning a vintage car is quite an experience. We want to help you keep your asset in its best condition. 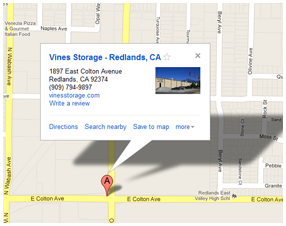 Visit our Redlands storage facility to see how your vintage car can maintain its original beauty.